If you live in the U.S., you will certainly not like anything the news that, according to the DMCA, Digital Millenium Copyright Act, is considered criminal start releasing a mobile phone without permission from the telephone company. Indeed it is an unjust law, which directly undermines consumer rights. If we paid the full price for a smartphone for two years spent with an operator, why do not we have the right to release it? We have to think we live in a borderless world in which we travel to other countries constantly. But phone companies force us to use their phones even in other areas, with high prices for roaming. The DMCA leaves us unprotected and without the option to insert a SIM of a foreign company on our phones. And it becomes even more striking: once the contract with your telephone operator concerned, it does not have to liberate your phone. For this reason there has emerged a petition can sign through the official website of the White House . If you get 100,000 signatures, the White House will have to respond to citizens' request seeking revision of the Digital Millennium Copyright Act page already has more than 83,000 signatures, but needed additional 17,000 signatures by February 23 (next Saturday) to the White House to consider the request. These regulations came into play on 26 January and only affects users who have purchased a smartphone as of this date and not before. The DMCA reduces consumer choice and decreases the value of a device by which the customer has paid one hundred percent of its value. If you believe that the Digital Millenium Copyright Act violates your options and rights as a consumer, we encourage you to sign this petition on the White House page . If you reach the 100,000 signatures, get an answer soon officially. 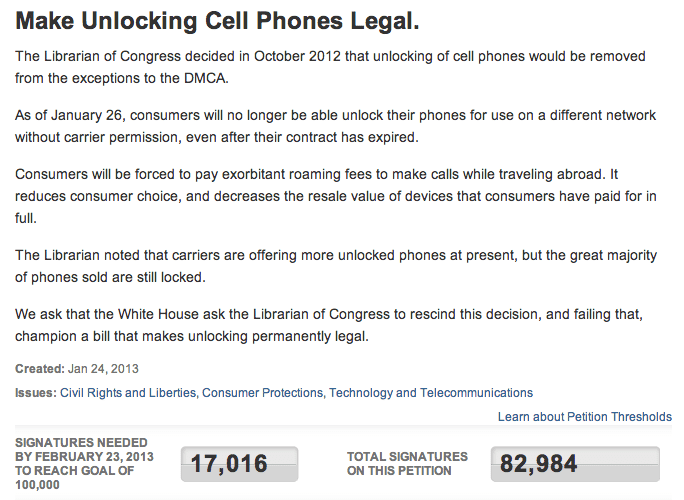 Article A petition to the White House to make legal back the release of mobile phones has been originally published in News iPhone .